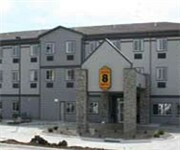 The Super 8 Bonner Springs is located in Bonner Springs, Kan.
How Would You Rate Super 8 Bonner Springs? 1. How did you find these budget accommodations, worth the price? 2. Where the rooms clean, safe and in working order? 3. Did the hotel have the expected amenities? Suggestions, bugs, feedback? Send them here. Copyright © 2019 Budget Bellhop. All rights reserved.